University of Maine men's hockey coach Red Gendron watches his team during a game at Alfond Arena in Orono. UMaine on Thursday announced that Gendron has signed a two-year contact that will take him through June 30, 2021. 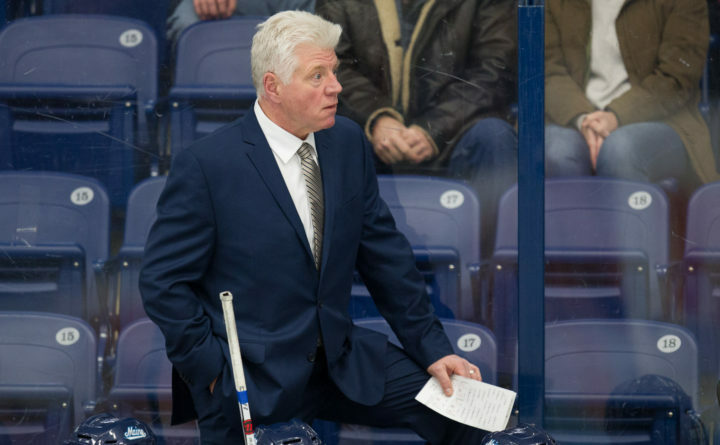 Dennis "Red" Gendron, pictured during the 2015-2016 season, has signed a two-year contract extension as the head men's hockey coach at the University of Maine. 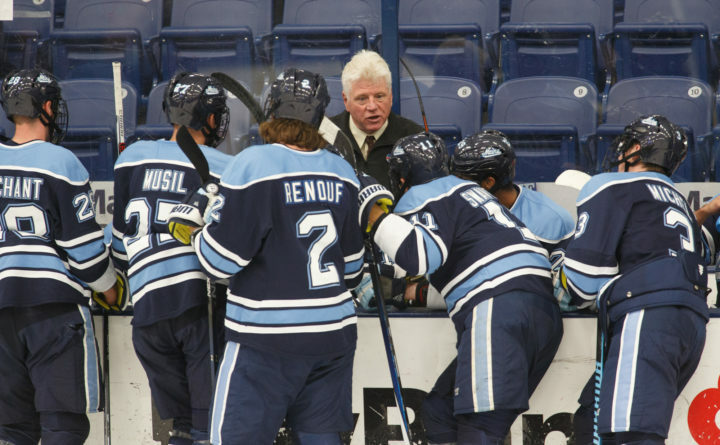 ORONO, Maine — University of Maine men’s hockey coach Red Gendron entered this season in a tenuous situation. He had two years left on his contract and was coming off three straight losing seasons and two consecutive 11th-place finishes in 12-team Hockey East. But Gendron’s fifth season turned out to be his best so far as the Black Bears went 18-16-4 — the most wins by a UMaine team since the 2011-2012 team went 23-14-3 and earned the program’s last NCAA tournament berth. This season’s performance helped earn him a two-year contract extension that was announced on Thursday. “I try not to think about those things. (Former New Jersey Devils general manager) Lou Lamoriello told me don’t worry about keeping your job, worry about doing your job,” said Gendron, who was an assistant with the Devils. The terms of the extension, which runs through June 30, 2021, remain unchanged from the current contract. He will earn $213,282.08 per year. UMaine, picked to finish last or tied for last in both preseason polls, tied for fifth (10-11-3) but was seeded sixth because it lost a tiebreaker to Connecticut. UMaine was swept archrival New Hampshire in their best-of-three first-round series but was swept by Providence in the quarterfinals. The Black Bears went 11-21-4 during 2016-2017 — 5-15-2 in Hockey East for the second straight year — but achieved its dramatic turnaround this season with one of the youngest teams in Hockey East. Five of the Black Bears’ top six scorers and four of their eight prominent defensemen were freshmen or sophomores and freshman goalie Jeremy Swayman earned an all-rookie berth. UMaine had only four seniors, three of whom played. They graduate defenseman and co-captain Mark Hamilton, left wing Nolan Vesey and center Cedric Lacroix, an alternate captain, and winger Malcolm Hayes, who did not play. Gendron said the future goal is to continue to climb the standings in Hockey East and earn an NCAA tournament berth. Gendron also praised assistant coaches Ben Guite, Alfie Michaud and Brad Schuler for their contributions. Gendron first came to UMaine in 1990 and for three seasons, including the 1993 NCAA national championship team, he was an assistant to coach Shawn Walsh. When Gendron returned to UMaine as head coach, he signed a four-year contract through June 2017. He previously signed a two-year contract extension in February 2016. Gendron, who just wrapped up his 39th year of coaching, said he is grateful to President Susan J. Hunter and Settele for the extension and said he is blessed to be coaching at UMaine. “I’m having a boatload of fun,” said Gendron. “It’s awesome to be able to work with young people. Some of them go on to play in the NHL but for others, the NHL just isn’t in the cards. Maybe they get to the AHL where they play just as hard and work just as hard as you do in the NHL. “Others go on to be successful in business. I can only hope that our program added values to their lives, personally and professionally,” said Gendron. Gendron said he always attends his players’ graduations.